Thank you for all of your encouraging comments and emails in response to my last post. I’m feeling much, much better this week and I can’t think of a more appropriate way to celebrate than with these vegan sweet potato pudding cups. 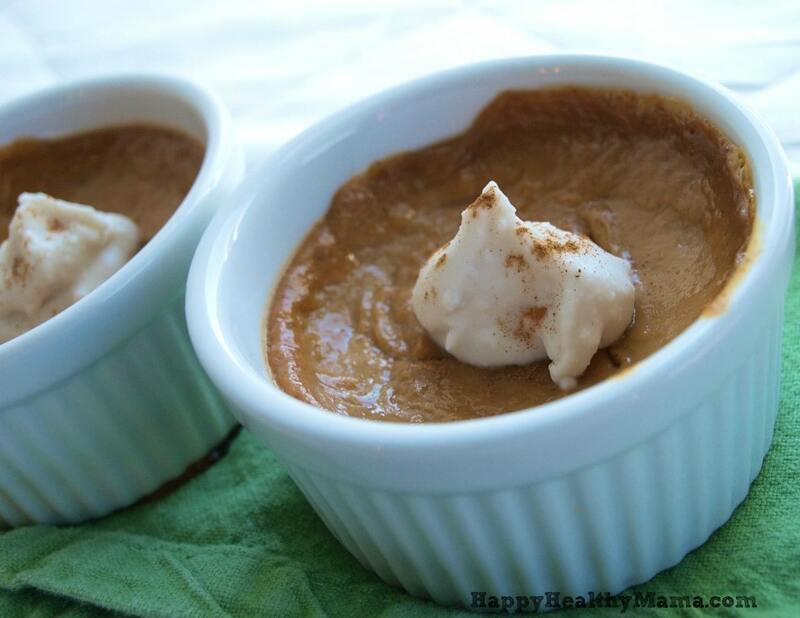 Just about a year ago, I saw these baked pumpkin puddings on smitten kitchen. I swooned. I dreamed about them. But I never made them. It was one of those recipes I couldn’t get out of my head, though, so I finally went back and looked it up, a year later. They still made me swoon. But, alas, they are made with heavy cream. Ah, it just wasn’t meant to be. I was still dreaming of a fall-ish, holiday-ish baked pudding, though, so I knew I had to try a version of my own. Heavy cream’s vegan counterpart is full-fat coconut milk, and it worked beautifully here. I decided since I was taking out the dairy, I might as well take out the eggs, too, and make this completely vegan. I was worried, though. Would the pudding still be rich and thick without the eggs? With much trepidation, I swapped the eggs for some ground flax seed meal+water. Much to my surprise and delight, it worked. There was one other major change. Instead of pumpkin, I went with sweet potato. I’m sure a pumpkin version would be amazing. But, I’m pretty much in love with all things sweet potato. I think it was a good choice. Topped with vegan coconut whipped cream for the win. 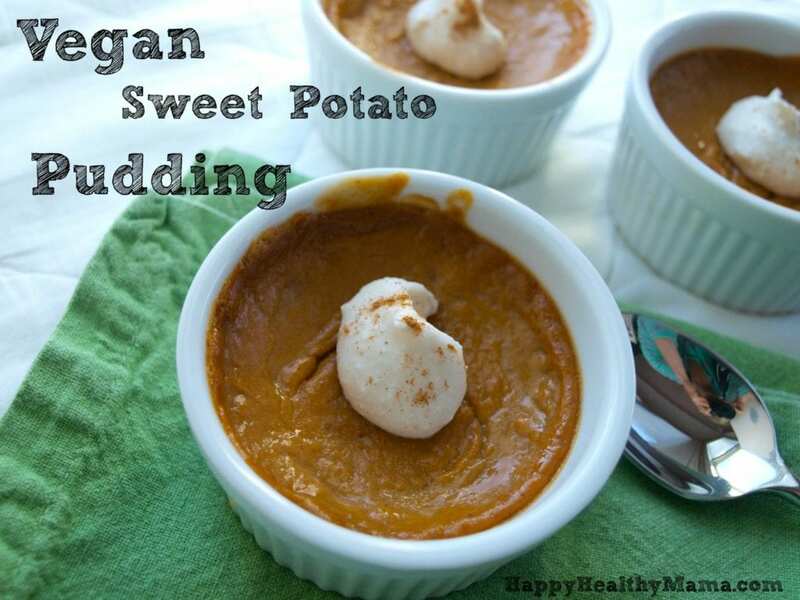 This baked sweet potato pudding is vegan, gluten-free, and soy-free. It makes a perfect holiday dessert. If your sweet potatoes are not cooked, do that first. You can either microwave them for about 10 minutes or bake them at 375 degrees for about an hour. When they are cooked, slice them open and scoop out the flesh. In a small bowl, combine the flax seed meal and water, and set aside. Combine the sweet potato, maple syrup, cinnamon, salt, ginger, and cloves in a food processor and process until completely smooth. Transfer the sweet potato mixture to a medium sauce pan and heat over medium high heat. When it starts to bubble a bit, give it a good stir. Allow it to cook for another 2-4 minutes, stirring frequently. Reduce the heat just a little and slowly whisk in the milk. Remove from heat and whisk in the flaxseed meal (which should be gelled by now) and whisk until it is well-combined. Divide the mixture between 6 small ramekins (about 1/2 cup per ramekin) that are placed on a baking sheet. Bake for 40 minutes. Remove from oven and allow to cool at room temperature for 1-2 hours, and then chill until ready to serve. Or, eat them warm. They’re really good that way, too. Enjoy! Thanks, Alexis! I seriously can’t wait to make another batch of this stuff–it’s my kind of dessert for sure. This looks like a great allergy-friendly Thanksgiving dessert! Glad you’re feeling better. Wow, really looks like you have been busy over the last month. Me too, so I haven’t looked at your blog for quite some time. Mastitis sounds terrible; my problem with breastfeeding was that I cannot make enough milk, even will all types of tricks. Of course being a first time mom 3 years ago, it took me 3 months to figure this out! Poor Emily! After 2 miscarriages following Emily’s birth; I am happy to report that I am 15 weeks pregnant and all is going well this time around. I have been nauseated and have had headaches, but will happily endure that for a healthy pregnancy. Praying that your mastitis stays away and you can finish nursing Luke on your own terms. You are a very remarkable and creative person, with your parenting and your recipes that is why I love your site! My grandma used to make “pumpkin pudding” all the time this recipe reminds me of her. Have a good week! Yum! I can just imagine how good these must be 🙂 Especially with a little bit of whipped coconut cream on top. Mmmm! So happy to hear you’re feeling better…that mastitis story did not sound fun. Thanks for sharing your story though. For those of us who have not had a child yet it helps to know what to look out for. Thanks for the vegan recipe too!! Excited to try it!